The Secondary Well provides an extra shot of gasoline instantly when the throttle is opened rapidly. The in flow of extra fuel at low speeds takes care of an otherwise lean mixture that would occur just off idle. There were several variations of Secondary Well designs, with the undercut in different locations. 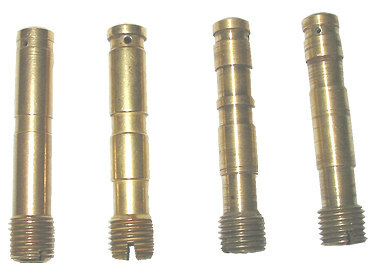 In some combinations of castings and secondary wells, the compensator jet will come into contact with the brass secondary causing restricted flow. So, I recommend that 2 gasket washers be used with this jet to prevent that possibility. With really dirty carburetors, the secondary well main bore and all of the small holes may need to be cleaned out. The small hole in one side is a #70 drill size, but it's not critical. The hole is referred to as the "vacuum breaker" hole. The small hole that goes through both sides is a #54 drill size, but it is not critical. The secondary well threads are 3/8x24 UNF (SAE).